Southern Railway is recruiting for the post of Medical Officers and Doctors. Interested and Eligible candidate can attend the walk in Interview on 20th July to 22nd July 2015. Company Profile: The Southern Railway, headquartered at Chennai, Tamil Nadu, is one of the 17 zones of Indian Railways. It is the earliest of the 17 zones of the Indian Railways created in independent India. Age Limit: 50 years / 65 years for retired govt Dr.
How to Apply: Interested and eligible candidate can attend the interview as per below mentioned scheduled dates. For more details kindly check official notification. 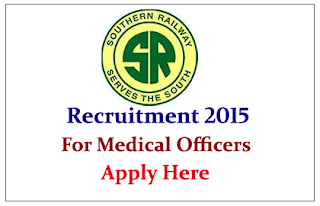 Walk in Interview on 20.07.2015: Divisional Office, Southern Railway, Trichy. Walk in Interview on 21.07.2015: Divisional Office, Southern Railway, Palakkad, Kerala.